Lisa Dilleen of the Tribesmen and Laura D'Urso of City of Derry celebrate winning the women's junior double scull in Munich. Dilleen crowned a successful weekend by also winning the single scull. Galway rower Lisa Dilleen has taken another step in her promising international career after capturing two gold medals at the prestigious junior regatta in Munich. The Tribesmen Rowing Club member, who is the current Irish junior single sculls champion, claimed the singles event and double title when teaming up with City of Derry’s Laura D'Urso. The regatta is regarded as the premier event at this level outside the World Championships, and follows Dilleen’s success at the 2008 Coupe de la Jeunesse. 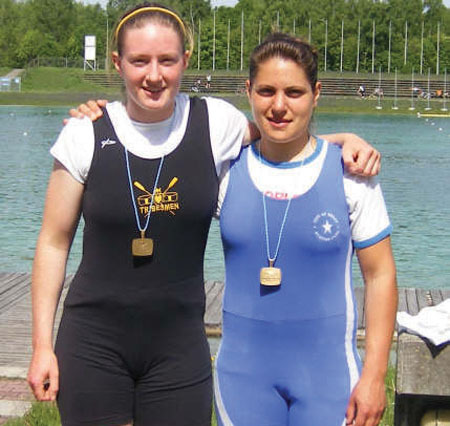 Entered in a field representing the cream of women's junior rowing from 11 European countries, Dilleen was drawn in heat two where she faced the highly regarded British entrant Rachael Gamble-Flint. Dilleen stamped her authority from the start, taking a length from the French rower by 500m. Gamble-Flint, who had started poorly, attacked with a vengence, closing the gap within three seconds 1000m and two seconds by 1500m. However she could not sustain the challenge as Dilleen maintained a three second/ 1 1/2 length lead by the line, recording a time of 8:23sec which was the fastest of the three heats by more than 15 seconds. The final was represented by Ireland, Britain, Germany, Slovakia, and Romania. One of the two Germans made her mark from the off and had a length advantage by 500m but Dilleen passed the halfway mark with a two second advantage. However the race was far from over as the British rower got into her strike, coming within 1/2length by the 1500m mark. Again, Dilleen dug deep and rebuffed the challenge to cross the line with a length and a half to spare and claim the first of her two golds. On the second day Dilleen and Laura D'Urso of City of Derry were up against competition from Germany, Croatia, Poland, Switzerland and Slovenia. The pair, who had also raced in the Coupe together, powered off the line, leaving their closest challengers, the Germans, three seconds adrift at 500m, nine seconds by 1,000m, and they strolled home thereafter, winning by 12 seconds (five lengths ) to cap a most successful weekend for the Tribesmen rower.